This card involved lots of stamping, and these are some of the best stamps I have ever used. They have such a crisp clean image and clean up is a snap! 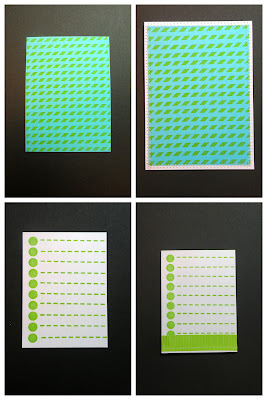 Step 1: Stamp background on aqua cardstock using the border stamp and the limeade ink. Mount it on white cardstock and sew around the outside to give you your sewn border. Step 2: Make your journaling card also by stamping the border stamps and limeade ink. Then attach fancy fills and sew along bottom. 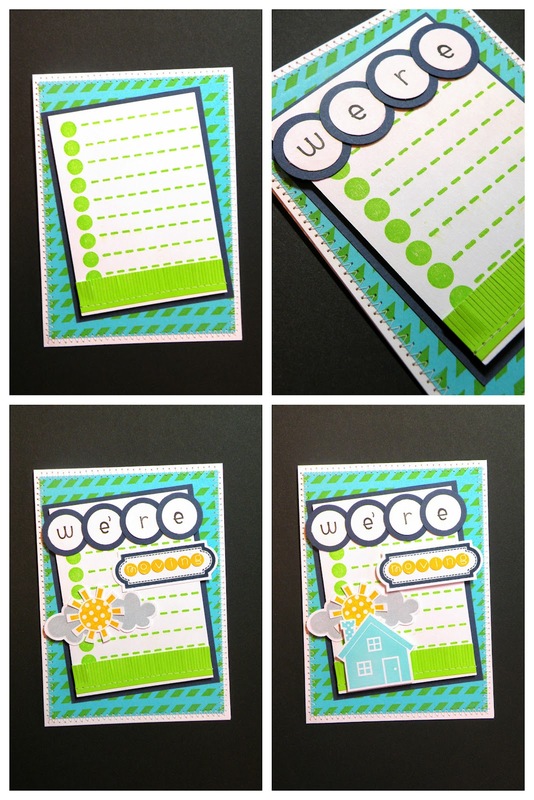 Step 3: Stamp out your house, sun, clouds, label, and the word we're. (The house sun and cloud stamps are all from the Home Sweet Home set, the labelstamp is from the Party Time set, and the alphas are from the Classics mini wood stamps is Simply Sweet font.) Cut each out leaving a white border. (I used a circle punch to punch out the letters). Step 4: Add teensy type alphas in bumblebee to the label spelling out the word "moving". Step 5: Assemble your card and admire. Hope you enjoyed :) if you did, stop by my blog ( http://www.mybitsofsunshine.blogspot.com/) and check out more Doodlebug cards and layouts. CUTE. I love all the bits and pieces you used on this card. Sweet. Cute card, love all the stamping. Nice use of cute teensy type.